The new TWIST "SHORTIES" interchangeable system containing both 2" and 3" (5cm & 8cm) tips allowing knitters to make short circulars 9" through 14" (23cm - 36cm) long, including differential circulars. 10 different sets of stainless steel lace tips in sizes US 4, 5, 6, 7, 8 (3.5, 3.75, 4.0, 4.5, 5.0mm) are included with the set. The 2" tips are solid and have a tightening hole near the threads. The 3" Tips are hollow. 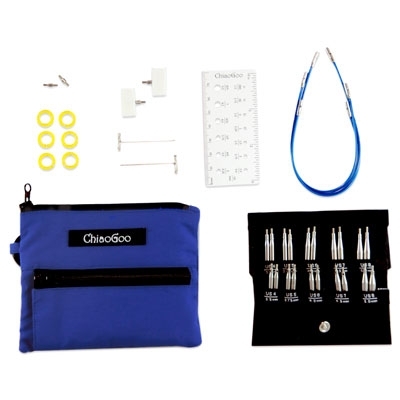 The set comes in a compact, blue nylon, zippered case as shown. It will also include a tip sleeve that securely holds all 10 sets of tips, end stoppers, stitch markers, a mini needle gauge (it's so cute!) and three different cable lengths. The cables included in this set are 5", 6" and 8" (13cm, 15cm & 30cm) long and are the same diameter as the current red SMALL cables.